Is mass tourism a form of colonialism or imperialism? This, essentially, is the question thoughtfully considered by Denise Fay Brown of the University of Calgary in her article, “Tourists as colonizers in Quintana Roo, Mexico”, published in the Summer 2014 issue of The Canadian Geographer. 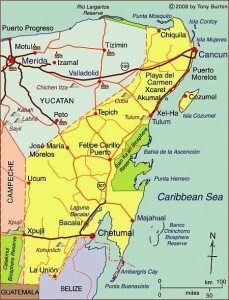 Map of Quintana Roo. Copyright 2010 Tony Burton. All rights reserved. One of the classic indicators of colonialism is spatial appropriation. Maya infighting aside, the earliest attempts at spatial appropriation in Quintana Roo were by Spain during early colonial times in the early sixteenth century. 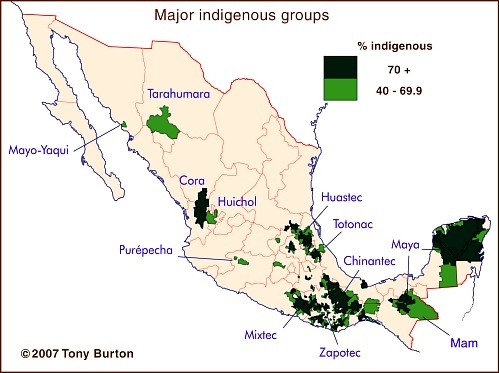 Even after independence in 1821, the Yucatán Peninsula resisted integration with the rest of the (new) nation. This resistance was not only due to cultural differences, but also to the Yucatán Peninsula’s location in the periphery, a long way from the seat of power in Mexico City. Indeed, despite the massive program of railway building that helped consolidate other parts of Mexico during the late nineteenth century, a rail link from central Mexico to the Yucatán Peninsula was only finally put in place in the 1950s. She makes a strong argument that the growth of tourism in the Yucatán Peninsula has been “predatory” and that foreign tourists, especially those engaging in mass tourism, are, in fact, unwitting colonizers. Thinking about the extent to which tourism is just one more manifestation of colonialism adds a whole new dimension to traditional tourism studies looking at economic, social and environmental advantages and disadvantages. Brown’s argument is persuasive, and, clearly, the political and cultural impacts of tourism deserve equal consideration. Denise Fay Brown. 2014. “Tourists as colonizers in Quintana Roo, Mexico”, The Canadian Geographer, vol 57, #2, Summer 2014, pp 186-205. An agreement between the National Anthropology and History Institute (INAH) and Google means that many of Mexico’s most famous archaeological sites can now be explored using Google’s Street View. Perfect for the armchair traveler! The system allows for viewers to rotate street level views the full 360 degrees horizontally, and 290 degrees vertically to take a “virtual walk” through such major sites as Teotihuacan, Xochicalco, Monte Albán, Chichén Itzá, Tulum, Palenque, Tula and Paquimé. Google’s images were captured by specially-designed equipment on bicycles that could navigate the paths and ruins without causing damage to the ancient structures. Google Street Views can be accessed via either Google Earth or Google Maps. Where is the best place in Mexico to celebrate the Spring Equinox? By way of contrast to the much-criticized, and now collapsed, Maya Biosana chocolate project, the Tikul Plantation, near Merida (Yucatán), is a well thought out cacao-growing project, with an educational component, being carried out by people who have decades of real experience with cacao. (Follow the link for a series of photos which gives a good idea of what is involved). Among the principles adapted by the Tikul project is biodynamic farming, which in this case means that “grafting is carried out when the moon is waxing and we harvest the pods when the moon is waning”. That cacao plantation, begun in 2008 by Belgian firm Belcolade, already has 10 hectares of land planted with 10,000 cacao trees (planting density of 1000 cacao trees/hectare). In addition, “20 more hectares have been cleared and cedar and mahogany trees, amongst others, have been planted”. The developers of that project already have the 20,000 cacao trees to be grafted to complete the planting of this area. The shade plants that have been planted include 2000 yucca (cassava), 4000 banana plants, 10,000 cedar trees and 5000 mahogany trees. This means an average planting distance of “a cacao tree every 3 meters, a cedar tree every 6 meters and a mahogany tree every 12 meters”. Visitors to the Tikul Plantation are introduced to the importance of cacao to the Mayan culture in the “Cacao EcoMuseum” near the Plantation’s entrance. The Cacao Ecomuseum is not without its critics. According to an article in the Yucatán Times, Becolade never received the appropriate permits from the National Institute for Anthropology and History (INAH) to build a structure in a protected zone. The article alleges that construction was only possible because certain INAH officials acted corruptly. Meanwhile another enterprise Choco-Story, with local partners, (and which has no connection to Belcolade as we incorrectly claimed in an earlier version of this post) has come under heavy fire in the press in recent months because it also started to build Chocolate Museums on the archaeological zones of Chichen Itza and Uxmal. Construction of both has now been halted, with INAH officials ordering that the partially-completed structures be demolished. The latest reports are that the conflict at Uxmal has been resolved and that the Choco-Story museum at that site will open sometime next year. 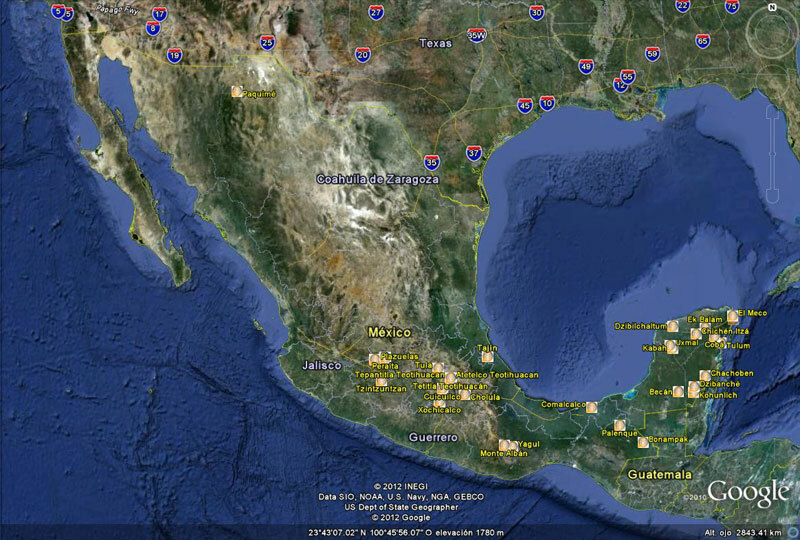 Other Comments Off on Where is the best place in Mexico to celebrate the Spring Equinox? The main pyramid at the Maya site of Chichen Itza in the Yucatán Peninsula is the most popular site in Mexico for crowds to gather and celebrate the Spring Equinox (March 20-21). The Maya were accomplished astronomers and were able to accurately predict equinoxes, eclipses and other celestial events hundreds of years in advance. Crowds gather to witness the serpent descend the pyramid. Original upload by shawn_christie1970 (Flickr). The main pyramid at Chichen Itza, known as the Pyramid of Kukulkan, has some unusual properties which researchers are still trying to explain. It is so precisely aligned that for a day or two either side of the Spring Equinox, the light falling on one side of the pyramid creates undulating shadows that look like a serpent slithering down the pyramid steps. The effect is best seen between 4 and 5 pm. 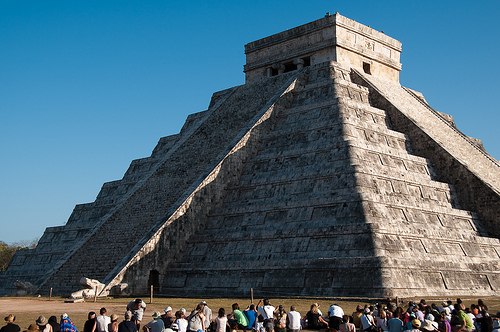 The slithering serpent is not the only surprise that the Pyramid of Kukulkan has in store for visitors. Kukulkan was a Mayan deity, the “feathered serpent”, more usually known in central Mexico as Quetzalcoatl. The Pyramid of Kukulkan is linked to the quetzal bird, because depictions of Kukulkan often show the distinctively long feathers of the quetzal. Standing in front of the pyramid and making a single hand clap results in an echo from the pyramid’s staircase, an echo which sounds like the downward chirp of a quetzal bird. David Lubman has proposed that this may be the earliest sound recording so far discovered anywhere on the planet. We may never know whether it was originally accidental or intentional, but Lubman makes a strong case for this chirp being a deliberate representation of the call of the Respendant Quetzal bird, a bird described in Peterson and Chalif’s Field Guide to Mexican Birds as “the most spectacular bird in the New World.” Quetzal birds were sacred to the Maya, and their feathers were highly prized; the birds were formerly common in the rainforest which originally cloaked this entire region. Lubman, David (1998) “Archaeological acoustic study of chirped echo from the Mayan pyramid at Chichen Itza, in the Yucatan Region of Mexico… Is this the world’s oldest known sound recording?“. Paper presented to the 136th Meeting of the Acoustical Society of America, October 1998. The state of Quintana Roo (see map below) has an area of 42,360 square kilometers and a population of 1,361,821 (2010 estimate). The state is one of Mexico’s flattest states, with its highest point being only 230 meters above sea level. Its distinctive landscapes include coastal barrier islands (such as the one Cancún’s hotel zone is built on), magnificent coral reefs and tropical karst (limestone scenery). It also has tropical forests and mangrove swamps. The state’s capital city is Chetumal (estimated 2010 population: 146,000), an important port and the gateway for overland connections to Guatemala. A short distance north of Chetumal is the beautiful, tranquil Laguna Bacalar. Until the mid-20th century, the state was best known for its chicle (used for chewing gum) collectors and its Mayan ruins. Many of these have been restored in the past 50 years or so, and are now important tourist attractions. The best known sites are Tulum perched on a cliff overlooking the azure Caribbean sea (and unfortunately all too accessible for cruise ship passengers) and Cobá, a magnificent city only partially cleared of jungle. Ecotourism is an important sector of tourism in Quintana Roo. Critics notwithstanding, one of the most memorable eco-related sites in the entire country is Xcaret marine park. The biosphere reserve of Sian Ka’an in the middle part of the state also draws large numbers of ecotourists. 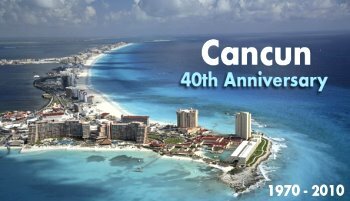 The purpose-built resort of Cancún, begun in 1970, has grown into Mexico’s most important tourist resort. Easily reached by plane from most parts of the USA, Canada and Europe, it is one of the world’s major destinations for package holidays. The area south of Cancún is often referred to as the Mayan Riviera; it is one of Mexico’s most rapidly developing tourist areas. Geo-Mexico: the geography and dynamics of modern Mexico looks at many aspects of Quintana Roo, including its socio-economic make-up and its development indicators. If you are interested in the geography of Mexico, please recommend this book to your local library or consider buying your own copy, as well as following this site with details of all new posts via e-mail, Facebook or Twitter.